Whether you are traveling to and from the airport, a wedding or a business meeting, limo service in San Francisco allows you to ride in style. Contrary to popular belief, limo service in the Bay Area isn't reserved exclusively for the rich and famous. If you are looking for group transportation to a San Francisco 49ers game or you simply want to enjoy a romantic night on the town with your special someone, hiring a limo service is a smart option. After all, what could be more convenient than being dropped off and picked up at your door and not having to worry about getting lost? Chauffeurs: Most San Francisco limo chauffeurs are highly experienced and professional drivers. This makes commuting a more relaxing experience, given that you don't have to worry about getting lost. Door-to-door service: This luxury is especially beneficial if you are using a limo to get to and from the airport. With a limo service you can get assistance with your luggage and not have to deal with the hassles of finding airport parking. 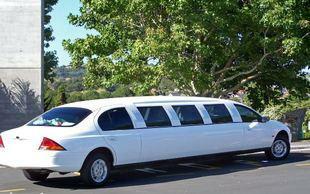 Tour packages: Almost all limo services in the Bay Area offer tour packages. The most popular ones include tours of California's Wine Country. By booking a limo service you can enjoy a wealth of wine tastings and avoid the risk of drinking and driving. Impress clients: Limos are a great choice for corporate travel. You can make a lasting impression on your out-of-town clients with a uniformed chauffeur driving them around the city on your company's behalf, assisting them with luggage and other requests. Group transportation: Super-polished stretch limos are ideal for transporting wedding parties from the church to the reception site. In addition, most San Francisco limo companies also offer large vehicles to accommodate groups attending birthdays, graduations, and sporting events. High price: If you are traveling alone or with one or two people, then booking a limo service may not be the most economical option. However, if you are traveling in a large group and splitting the rental fee equally, then the price of renting a limo may be comparable to that of traditional car service in San Francisco. Additional fees: Some limo companies charge mileage and license fees in addition to charter service fees and tolls. As a general rule, you should inquire about all charges prior to booking a limo service. Time limit: Most limo services in San Francisco require customers to book at least three hours of service for group transport. On the weekends, the minimum is four hours. The restrictions are subject to change during prom season or major holidays, including New Year's Eve.